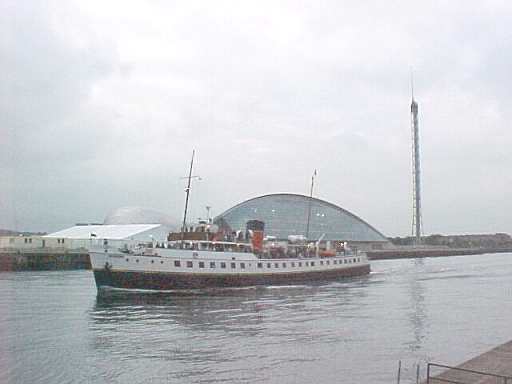 If you were looking for Balmoral on Friday 21 September 2001 and missed her - she was sailing about one hour after advertised sailing times due to a delay incurred at Anderston Quay in the morning. The special 2 for 1 Senior Citizens' fare proved a great success, bringing over 500 passengers to Anderston Quay including over 50 wheelchair occupants. Unfortunately this coincided with dead low water on the equinoctial spring tide and Balmoral's deck was a long way below Anderston Quay. Her deck crew had the unenviable task ofcarrying 50+ wheel chairs and occupants from the quay to the bridge deck then down onto the promenade deck. To compound the difficulty some people decided that the ship was too busy for them and had to be carried back ashore before the motorship could leave for Rothesay. A truly Herculean feat by the crew - well done to Captain Steve Colledge and all the others. Here is the Bal passing the Glasgow Science Centre at about 1840 in her new, temporary Macbrayne plus band livery - sorry about quality light was not good. She is to do charter work for the BBC at Tarbert Loch Fyne on Tuesday 25 September and Waverley Excursions are offering an extra sailing Glasgow to Tarbert that morning. Contact Waverley Excursions for more details - 0141 243 2224.